Just to be completely clear, I've been writing posts like this and this not in order to convey rubber-stamp approval of everything President Trump is doing. My analysis, as usual, is rooted in a case-by-case, "call 'em as I see 'em" philosophy -- which has produced decidedly positive and negative appraisals. No, more than anything else, these polling posts are shots across the media's bow. The press is by and large adamantly opposed to Donald Trump's presidency and agenda. Much of their related coverage has fallen somewhere on the spectrum of hostile to apocalyptic, and has at times been overblown or inaccurate, to boot. The latest NBC/WSJ national survey should give The Resistance and their elite media cheerleaders some pause as they evaluate their collective posture toward the new administration. It probably won't, but it should. In the poll, a majority (51 percent) says that since the election, the media has been too critical of Trump, with just six percent demanding tougher coverage of him. Only four-in-ten Americans believe the media has treated him in a fair and objective manner overall. Further, 53 percent agree with the following statement: "The news media and other elites are exaggerating the problems with the Trump administration because they are uncomfortable and threatened with the kind of change that Trump represents." Forty-five percent disagree. This is evidence of a gaping disconnect. NBC/WSJ poll: Who should take the lead in setting policy for the US? 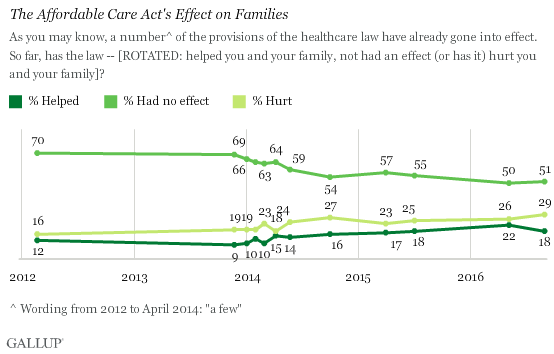 NBC/WSJ is the latest poll to confirm that significantly more Americans have been harmed by #Obamacare (30%) than helped (24%).